Topology describes properties of a physical system that remain unaffected by distortion. The most straightforward example is the “genus”: the number of holes of a closed surface. 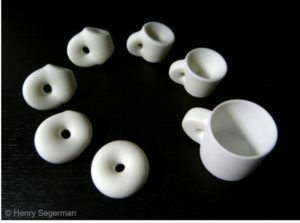 For instance, a mug and a donut both have a hole, they both possess the same topological invariant (genus=1) and they can be transformed into each other via smooth deformations. In solid state materials we can apply the same idea: we can define a topological invariant related to the properties of the electronic bands. Even though the bands and electronic eigenfunctions change when we deform the material, the topological invariant remains the same, and the only way to change it is by closing the gap between the bands. This has a very important consequence: when two materials with bands with different topological invariants are brought together, the gap needs to close exactly at the frontier between the materials. This means that an interface mode appears in the middle of the gap. 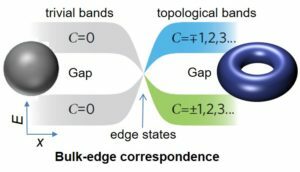 As the existence of this “edge” mode is related to the topological properties of the bulk, it will always be there, no matter the shape of the region between the two materials. These concepts have explained the chiral edge transport in the quantum Hall effect, which is robust to disorder in the Hall bar, or the emergence of topological insulators that conduct only on their surface. 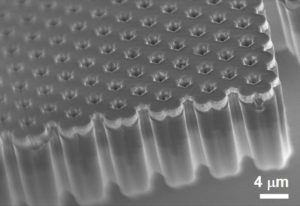 Implementing these ideas in photonics would be a promising route towards photonic devices with transport immune to scattering. Namely, photons in a topological lattice would be able to travel on the edge of the lattice no matter its shape. In the past few years, we have implemented polariton lattices with topological properties. In particular, we have addressed the physics of the honeycomb lattice, Fibonacci potentials and the Su-Schrieffer-Heeger (SSH) lattice, and we have demonstrated the existence of edge states connected to the properties of the bulk. In the SSH lattice, we have obtained the first laser in a topological mode, and we have shown that it is robust to local perturbations of the photonic potential (see focus here). In a classical fluid turbulence describes the redistribution of the energy injected in the system from large length-scales to small length-scales. 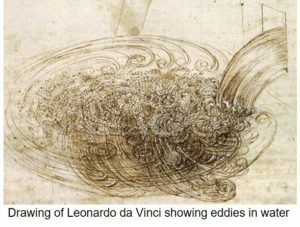 The most popular manifestation of this phenomenon is the appearance of vortices and eddies in turbulent flow of water. In a photon fluid, the great challenge to observe turbulent phenomena has been to obtain strong enough interactions. Polaritons in microcavities have proved to be ideal to study this kind of physics. 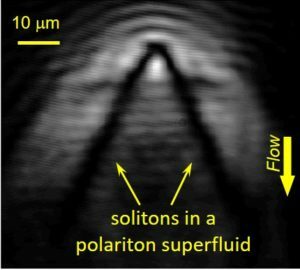 The demonstration of polariton superfluidity and the nucleation of vortices and solitons have been the first steps in the investigation of turbulent cascades in fluids of light, and it is one of our active research lines. A. Amo, S. Pigeon, D. Sanvitto, V.G. Sala, R. Hivet, I. Carusotto, F. Pisanello, G. Lemenager, R. Houdre, E. Giacobino, C. Ciuti, A. Bramati, Science 332, 1167 (2011). D. Sanvitto, S. Pigeon, A. Amo, D. Ballarini, M. D. Giorgi, I. Carusotto, R. Hivet, F. Pisanello, V. G. Sala, P. S. Soares-Guimaraes, R. Houdré, E. Giacobino, C. Ciuti, A. Bramati, G. Gigli, All-optical control of the quantum flow of a polariton superfluid, Nature Phot. 5, 610 (2011). A. Amo, J. Lefrère, S. Pigeon, C. Adrados, C. Ciuti, I. Carusotto, R. Houdré, E. Giacobino, A. Bramati, Nature Phys. 5, 805 (2009).